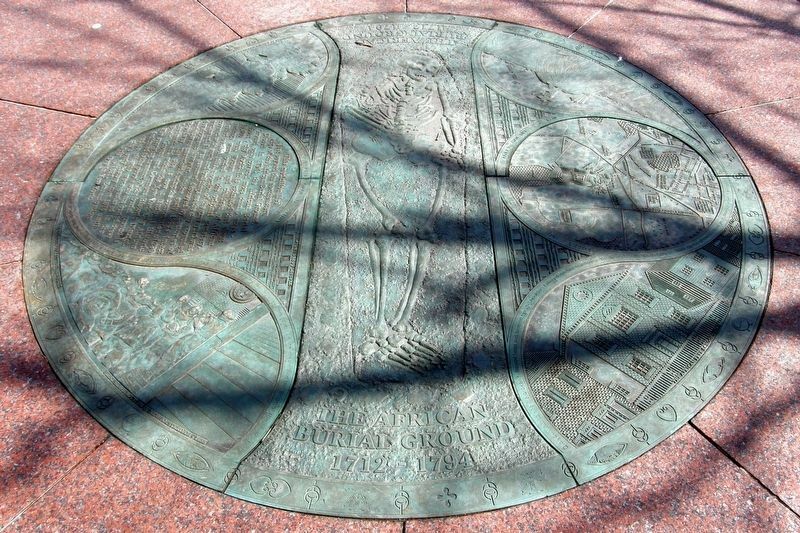 This medallion lies just beyond the edge of the African Burial Ground. 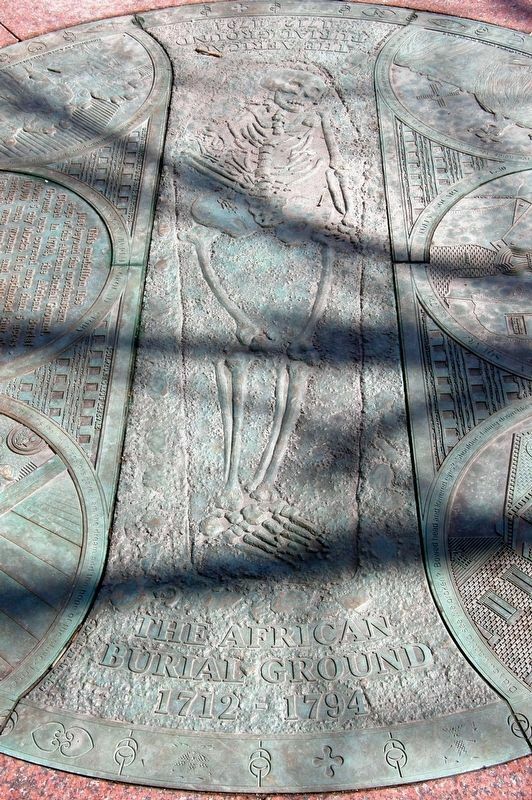 Closed in 1794, the African Burial ground once covered more than 5 acres – about 5 city blocks. It is estimated that about 10,000 men, women and children of African Heritage were buried in the original cemetery. Nestled between hills, a portion of the graveyard was covered with earth and buildings as the city expanded northward. It was assumed destroyed by centuries of development; however, in the early 1900’s intact burials were unearthed during the construction of 290 Broadway. 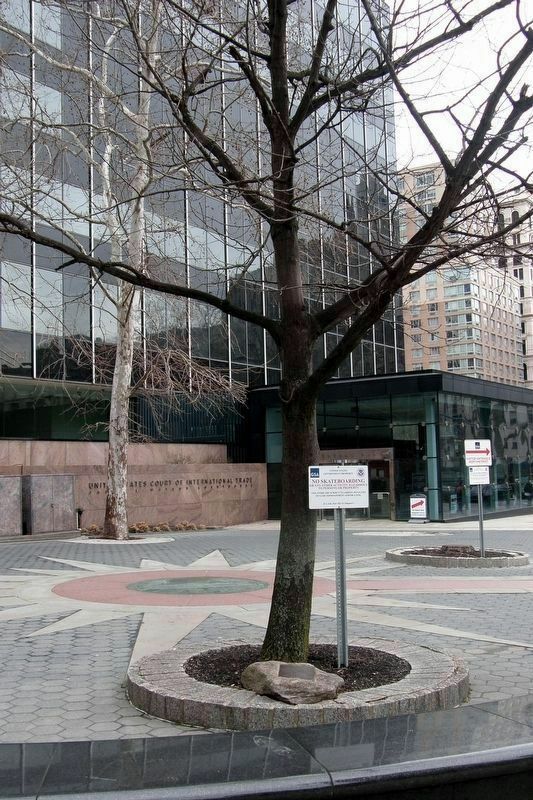 The site is now a National Historic Landmark and within the New York City African Burial Ground and Commons Historic District. The surviving remnant of the burial ground is dedicated to all who were enslaved in the city’s early history from 1825 until July 4, 1827, Emancipation Day in New York. Location. 40° 42.854′ N, 74° 0.209′ W. Marker is in New York, New York, in New York County. Marker is at the intersection of Lafayette Street and Duane Street, on the right when traveling south on Lafayette Street. Touch for map. The marker is set flat into the pavement. Marker is in this post office area: New York NY 10007, United States of America. Touch for directions. The Judge Walter R. Mansfield Memorial is also visible. (within shouting distance of this marker); African Burial Ground (within shouting distance of this marker); Civic Center (within shouting distance of this marker); Africans in Early New York (within shouting distance of this marker); Changing Landscape Obscures the Past (within shouting distance of this marker); Foley Square c. 1800 (within shouting distance of this marker); Sacred Tradition, Sacred Ground (within shouting distance of this marker). Touch for a list and map of all markers in New York. Regarding Foley Square c. 1730. One of several markers in the area dealing with Foley Square and/or The African Burial Ground. Center motif: Foley Square c. 1730 area map with a “You Are Here” reference point near the center. Text ribbon: Do you want to see me broken?/Shoulders falling down like teardrops/weakened by my soulful cries./Does my haughtiness offend you?/Don’t you take it awful hard/cause I laugh like I got a gold mine/diggin’ in my own backyard./You may shoot me with your words./ You may cut me with your eyes./You may kill me with your hatefulness,/But still like air I rise. More. Search the internet for Foley Square c. 1730. Credits. This page was last revised on April 10, 2019. This page originally submitted on March 9, 2019, by Larry Gertner of New York, New York. This page has been viewed 35 times since then. Photos: 1. submitted on March 9, 2019, by Larry Gertner of New York, New York. 2. submitted on March 23, 2019, by Larry Gertner of New York, New York. 3, 4, 5. submitted on March 9, 2019, by Larry Gertner of New York, New York. • Bill Pfingsten was the editor who published this page.